Hi Everyone! I know I've been away from blogging for a bit but I'm really looking forward to being finished work at the end of this week so I can get back to writing and finally tackling some house projects too! I still can't believe what a blur the past almost 9 months have been. While I've taken time to savor every moment as best as possible, it's amazing to me how quickly time has passed by. I've heard from so many moms that the last month or so feels like time is standing still. I'm not sure I'll experience that feeling though, we have yet to paint the nursery and get all of the furniture and accessories in order. I know once we paint the walls, I can tackle the other smaller projects like accessorizing and hanging drapery after she's born at some point if I absolutely have to or if she arrives earlier than expected, since she'll be sleeping in a bassinet in our master bedroom. I was hoping to share her nursery with you all right after her birth but I'll have to wait and see how everything plays out. Wish me luck in getting everything done in time! That has been a goal of mine so I can just focus on her and also enjoy the newly decorated space to feed her, cuddle her and read to her. I promised to keep you all in the loop and I've been keeping up with bi-weekly progress photos and sharing them on my personal Facebook page so I wanted to share the latest with you all too. My baby shower took place last Saturday, it was small with mostly family and a few friends as some were away for summer holidays and all of my closest friends and my own family live back home in Canada. It was a nice time to see so many sweet faces at one event and their presence and desire to celebrate baby girl and I meant the world to me. While I'm still feeling great, I'm getting tired and naps are a beautiful thing! I'm taking some time to squeeze in time with friends now before I become more house-bound in the coming months and I'm also picking up the final items we need for our little one (there's quite a long list still, let's just say that in my experience people don't seem to like to buy from a registry) but I'm trying to stick to the most important items and am not at all shy of second hand items-kids grow so fast, I just couldn't fathom spending an insane amount on brand new baby clothes-over 95% of her wardrobe is carefully selected, gently used clothing in excellent condition all washed and categorized by size and I wouldn't have it any other way. :) Of course I've had fun choosing a few new outfits for her too which I'm excited to see her wear and take photos of her in and have found a few headbands and other prop items for her newborn shoot which I hope to do when she's 10 days old or less. Now, I'd like to ask all of you mothers....what was the most surprising thing about the last month of your pregnancy? Did it zoom by before your eyes or did each day leading up to the birth feel like an eternity? Did you spend your time relaxing, nesting and preparing the house or maybe you were working up until the last days? I'd love to hear from you! Do you have any special words of advice as I get closer to the delivery day? Thanks for reading, taking the time to leave kind and encouraging comments over the months and for following along as I journey into motherhood! Today's post is a quick one for all of you moms with little ones out there! 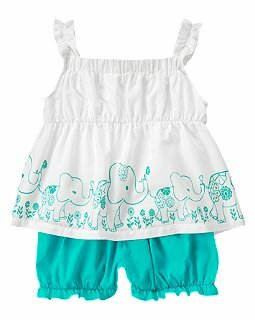 I was just alerted to a fantastic deal on markdowns at Crazy 8 (affiliated with the Gymboree company) for baby and kids clothing. This is a pretty sweet sale, now is the time to stock up on adorable outfits during the Crazy 8 online only deal! 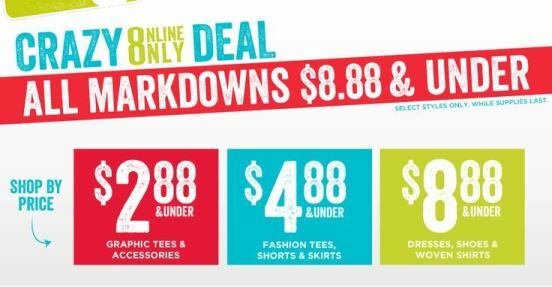 For today only Crazy 8 is offering all markdowns for $8.88 & under! Don't miss your chance to stock up on tops, bottoms, dresses and more! This offer is only valid on 7/17 while supplies last, so be sure check out Crazy 8 today! Leopard print bikini for just $2.88. 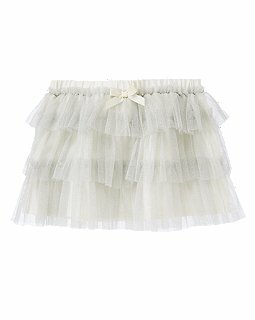 Tulle sparkle skirt for just $4.88. Rosette Tulle Skirted Bikini for just $6.99. Win $200 or His & Hers Kindles with Datevitation! Hi Everyone! 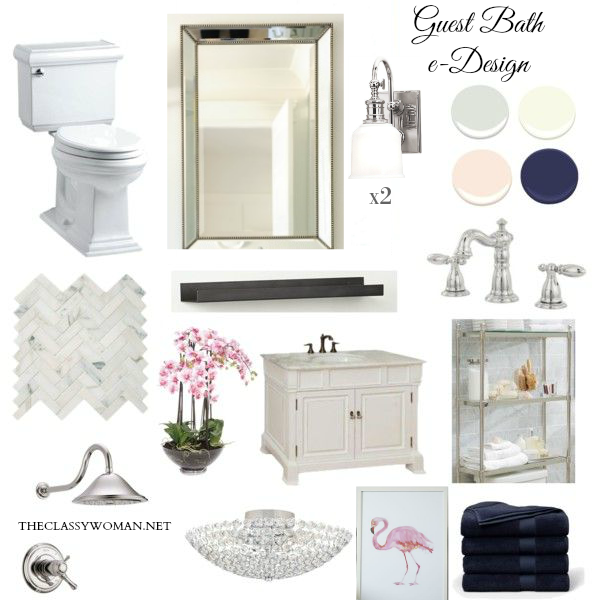 I wanted to share a wonderful giveaway with all of you that you won't want to miss! You may remember Datevitation from our Valentine's Day giveaway I did a few months back, now they are hosting their own and are giving one lucky reader a chance to win $200 cash via Paypal or a set of His & Hers Kindles!! All you need to do is enter via the Rafflecopter widget below. If you loved the Datevitation coupon books, they are also providing a $10 off coupon towards any of their great books, for The Classy Woman readers using the code: CLASSY10! Hurry! The giveaway and promo code end on July.31st! Wishing all of my American readers a safe, relaxing and Happy Independence Day today as we celebrate the many freedoms we have in this country. 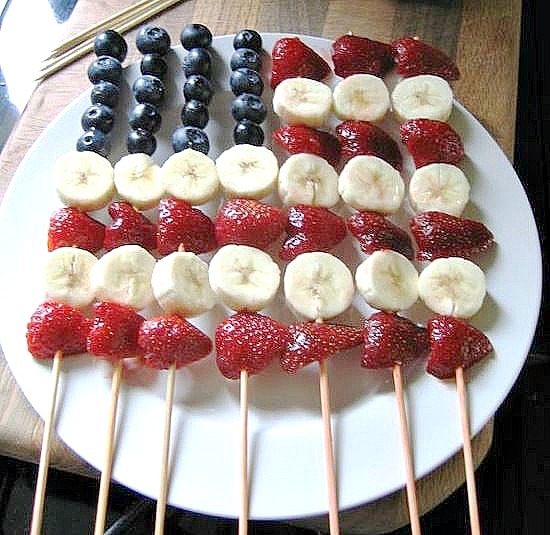 In case you're heading to a BBQ or party and are looking for a fun, fast and healthy recipe to take with you, I've seen a few variations of these American flag skewers of blueberries, strawberries and bananas. How cute are they? I'm taking advantage of this day off to work on a few home improvement projects, what is everyone else up to today? Happy Canada Day to my Canadian friends! I'm wearing red & white today and celebrating with you in spirit. :) Happy Monday to everyone else. 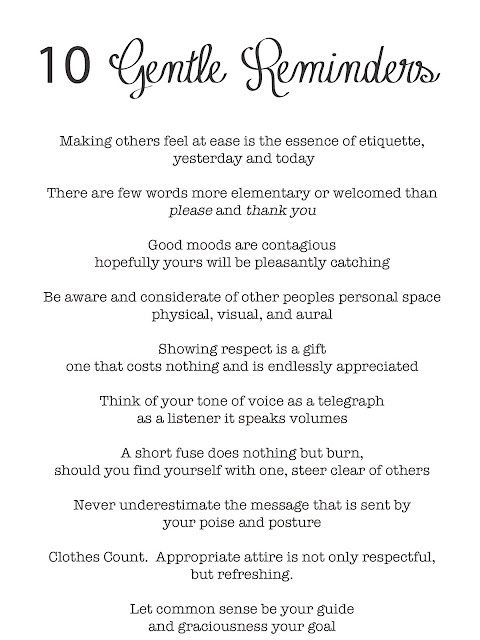 While most of our Manners Monday posts are very specific in topic, today's post is short and sweet including 10 Gentle Reminders on manners and what every classy woman should be mindful of. I did not create this list but thought it was worth sharing with you all. It was created by Kate Spade, Fashion Designer of ladylike, classic women's apparel and accessories.